iRig Stomp is a stomp box pedal version of the popular AmpliTube iRig guitar and bass interface for iPhone, iPod touch and iPad that revolutionized the world of mobile music creation and performance. 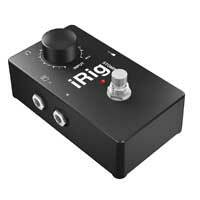 Designed for live play, iRig Stomp integrates easily with any traditional pedalboard or amplifier. Its sturdy metal housing is stage-ready and it can be connected directly to an or PA without the need for adaptors. iRig Stomp also features greatly enhanced internal circuitry that improves audio quality (especially with high-gain amp and effects) and allows you to adjust for any type of guitar or bass signal, from quiet passive pickups to loud active instrument circuitry. iRig Stomp sports a heavy-duty switch for bypassing the effects running on your iPhone or iPad, letting you use your device just like a traditional stomp box. Built-in headphones also make it ideal for silent practicing. iRig Stomp is a perfect sequel for previous iRig users that want to expand take their iOS apps to the stage, and a high-quality solution for ? newcomers that want to connect their guitar or bass to their Apple device and take advantage of the world of guitar- and bass-related apps.